Found on lds.org: "The Sacred Record," The Testimony of the Prophet Joseph Smith, (1999), 8-9. First, a hole of sufficient depth, (how deep I know not,) was dug. At the bottom of this was laid a stone of suitable size, the upper surface being smooth. At each edge was placed a large quantity of cement, and into this cement, at the four edges of this stone, were placed, erect, four others, their bottom edges resting in the cement at the outer edges of the first stone. The four last named, when placed erect, formed a box, the corners, or where the edges of the four came in contact, were also cemented so firmly that the moisture from without was prevented from entering. It is to be observed, also, that the inner surface of the four erect, or side stones was smooth. This box was sufficiently large to admit a breast-plate, such as was used by the ancients to defend the chest, &c. from the arrows and weapons of their enemy. From the bottom of the box, or from the breast- plate, arose three small pillars composed of the same description of cement used on the edges; and upon these three pillars was placed the record of the children of Joseph, and of a people who left the tower far, far before the days of Joseph, or a sketch of each, which had it not been for this, and the never failing goodness of God, we might have perished in our sins, having been left to bow down before the altars of the Gentiles and to have paid homage to the priests of Baal! I must not forget to say that this box, containing the record was covered with another stone, the bottom surface being flat and the upper, crowning. But those three pillars were not so lengthy as to cause the plates and the crowning stone to come in contact. I have now given you, according to my promise, the manner in which this record was deposited; though when it was first visited by our brother, in 1823, a part of the crowning stone was visible above the surface while the edges were concealed by the soil and grass, from which circumstance you will see, that however deep this box might have been placed by Moroni at first, the time had been sufficient to wear the earth so that it was easily discovered, when once directed, and yet not enough to make a perceivable difference to the passer by. So wonderful are the works of the Almighty, and so far from our finding out are his ways, that one who trembles to take his holy name into his lips, is left to wonder at his exact providences, and the fulfilment of his purposes in the event of times and seasons. A few years sooner might have found even the top stone concealed, and discouraged our brother from attempting to make a further trial to obtain this rich treasure, for fear of discovery; and a few later might have left the small box uncovered, and exposed its valuable contents to the rude calculations and vain speculations of those who neither understand common language nor fear God, but such would have been contrary to the words of the ancients and the promises made to them: and this is why I am left to admire the words and see the wisdom in the designs of the Lord in all things manifested to the eyes of the world: they who show that all human inventions are like the vapors, while his word endures forever and his promises to the last generation. Latter Day Saints' Messenger and Advocate, 3 vols. (published 1834-1837). Editor Note: Oliver Cowdery did not claim to have ever seen the stone box. He is retelling what Joseph told him. This is evident by the fact that Oliver said "I only promised to give a description of the place at the time the records were found in 1823". Oliver of course reportedly did not meet Joseph Smith until 1829 but the plates were removed by Joseph in 1827. He also said he did not visit the area [Hill Cumorah] until 1830. The Orators of Mormon," Catholic Telegraph (Cincinnati, Ohio) 1 (14 April 1832): 204–5. Reprinted from Mercer Press (Pennsylvania), circa April 1832. A hole of sufficient depth had been dug, and a flat stone laid in the bottom ; then there were four set erect at the outer edges of the bottom stone, joined together with some kind of cement, so as to form a Box. On the bottom stone was laid a Shield or Breastplate, from that arose three pillars made of cement. On the top of these pillars laid the Record, together with the " Urim and Thummim," the whole not to extend quite even with the top of the side stones. Over the whole was placed a crowning stone, a small part of which was visible, when he first visited the spot. W. I. Appleby, A Dissertation of Nebuchadnezzar's Dream... (Philadelphia: Brown, Bicking & Guilbert, 1844), 1–24. Were there accounts of other Stone Boxes? Some early Church members believed that the Nephites hid numerous stone boxes in the Palmyra area that they hoped contained some form of treasure but they never actually recovered any of these boxes, although some stories remain of their adventures - whether real or imagined. There was one account from Ole A. Jensen that claims Martin Harris first affirmed his testimony of the Book of Mormon and then relayed an account where Martin went treasure hunting and claimed to have encountered another stone box. Note: This is not the stone box that the gold plates reportedly came in, but a different stone box that Martin claims he found on Hill Cumorah. Although this story has nothing to do with the stone box that reportedly held the gold plates, we include it since both critics and faithful LDS refer to this story to provide parallel evidence for the stone box that held the gold plates. Brother Harris then turned over as if he had no more to say and we made ready to leave. He spoke again and said, "I will tell you of the most wonderful thing that happened, after Joseph received the plates. Three of us, myself and two more, took some tools and went to the hill to dig for more plates of gold or something and indeed we found a stone box. We got quite excited and dug around it very carefully and just when we were ready to lift it up out of the hole, some unseen power slid it back into the hill. We stood and looked at it and one of us tried to drive a crowbar through the lid to hold it, but the crowbar glanced off and the corner of the lid was chipped off. Sometime that box will be found and you will find one corner of the lid broken and you will know that I have spoken the truth. Ole A. Jensen, "Testimony Given to Ole A. Jensen by Martin Harris," July 1875,3, archives, Historical Department, Church of Jesus Christ of Latter-day Saints, Salt Lake City (hereafter LDS archives); quoted in Dan Vogel, Early Mormon Documents 2:376. Sometimes I take the liberty of talking a little further with regard to such things. Orin P. Rockwell is an eyewitness to some powers of removing the treasures of the earth. He was with certain parties that lived nearby where the plates were found that contain the records of the Book of Mormon. There were a great many treasures hid up by the Nephites. Porter was with them one night where there were treasures, and they could find them easy enough, but they could not obtain them. I will tell you a story which will be marvelous to most of you. It was told me by Porter, whom I would believe just as quickly as any man that lives. When he tells a thing he understands, he will tell it just as he knows it; he is a man that does not lie. He said that on this night, when they were engaged hunting for this old treasure, they dug around the end of a chest for some twenty inches. The chest was about three feet square. One man who was determined to have the contents of that chest, took his pick and struck into the lid of it, and split through into the chest. The blow took off a piece of the lid, which a certain lady kept in her possession until she died. That chest of money went into the bank. Porter describes it so [making a rumbling sound]; he says this is just as true as the heavens are. I have heard others tell the same story. I relate this because it is marvelous to you. But to those who understand these things, it is not marvelous. Editor comment: Notice in the Ole Jensen statement, Martin is telling of an incident in which he, Porter Rockwell and another (perhaps Joseph Smith), were involved in a treasure dig at Cumorah "after Joseph had received the plates" where they were looking "for more plates of gold or something" and they found "a stone box". If it was the same one that held the original plates, he would have said "the" stone box. Thus, whatever stone box was struck was not the box containing the gold plates, but another stone box supposedly buried at Cumorah. These stories serve to show the magical mind set of the early Church members. To believe Martin Harris' account of this stone box means that we have to accept that the stone box moved beneath the earth to avoid capture. That strains credibility but is characteristic of other unbelievable tales told by Martin. Joseph Smith's treasure seeking adventures go into detail of how he was employed by the money-diggers to find treasure using his seer stone, but he would always seem to have an excuse as to why they couldn't actually find the treasure even though he saw it in his stone. Often Joseph would say that the treasure kept sinking further into the ground as they dug or that the spirits of dead Indians were guarding the treasure and wouldn't let anyone have it or they said the wrong words and ruined the enchantment, etc. See the glossary entry for scrying for additional information about using stones for treasure hunting. Stone Box pieces lying at the bottom of Hill Cumorah? Reminiscences of Joseph the Prophet, And the Coming Forth of the Book of Mormon by Elder Edward Stevenson, 1893 Salt Lake City, Utah. 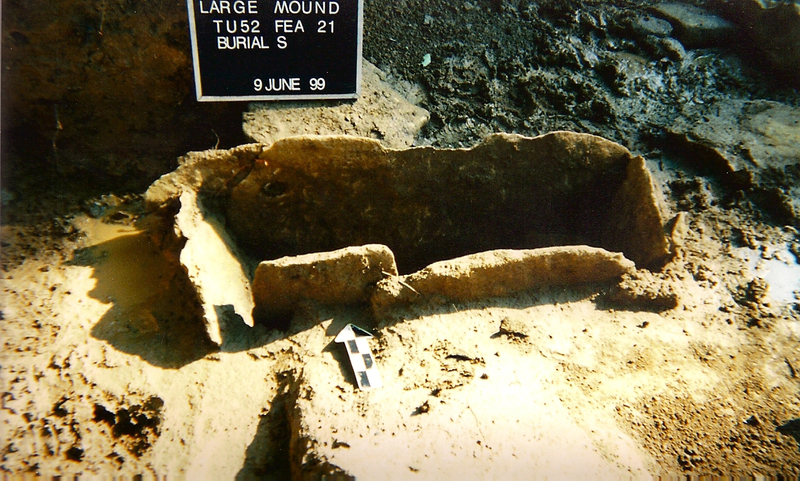 Editor Comment: David Whitmer may have referred to the stone box as a 'casket' as some Native Americans commonly buried their dead in stone box graves. Photos here. He did not actually see the stone box but was likely only told of it by Joseph as Whitmer first heard of Joseph Smith and the golden plates in 1828 but the plates were removed by Joseph in 1827. Joseph also never stated that the stone box was shown to anyone. The stones at the bottom of the hill were probably there when it was subsequently plowed by the owner, Randall Robinson or his heirs. After [he] went from the house, my mother says 'What a liar Joseph Smith is; he lies every word he says; I know he lies because he looks so guilty; he can't see out of his eyes; how dare [he] tell such a lie as that.' The time he claimed to have taken the plates from the hill was on the 22 day of September, in 1827, and I went on the next Sunday following with five or six other ones and we hunted the side hill by course [i.e. "in a search pattern"] and could not find no place where the ground had been broke. There was a large hole where the money diggers had dug a year or two before, but no fresh dirt. There never was such a hole; there never was any plates taken out of that hill nor any other hill in country, was in Wayne county. It is all a lie. No, sir, I never saw the plates nor no one else. He had an old glass box [i.e. a box used for holding plates or panes of glass] with a tile in it, about 7x8 inches, and that was the gold plates[;] and Martin Harris didn't know a gold plate from a brick at this time. Lorenzo Saunders, Letter to Thomas Gregg, 28 January 1885, Charles A. Shook, The True Origin of the Book of Mormon (Cincinnati, Ohio: Standard Publishing Co., 1914, p. 134-35). Cited in: Dan Vogel, ed., Early Mormon Documents, 3 vols. (Salt Lake City: Signature Books, 1996-2000, 3:177-79. Dan Vogel, Early Mormon Documents, vol. 2, Salt Lake City: Signature Books, pp. 159-60. Perhaps even more important than Lorenzo Saunders' statements about not being able to find evidence of a freshly dug hole a week after Joseph claimed to have removed the plates is Saunder's statement that there was already digging on the east side of the Hill Cumorah. That is where many assumed the plates came from. In process of time many pits were dug in the neighborhood, which were afterwards pointed out as the place from whence the plates were excavated. Mormonism Unvailed, Eber D. Howe, pp. 12-13. Undoubtedly the most significant of Smith's treasure quests occurred on a prominent hill, now known as the "Hill Cumorah," situated on the east side of the Canandaigua Road in the northwest quadrant of Manchester Lot 85, then part of the Randall Robinson farm. Certainly Smith's discovery of the gold plates in 1823 and subsequent activities on the hill occurred within a treasure-seeking context. Of particular interest is the claim that Smith and his friends dug on the hill sometime before Smith removed the plates on 22 September 1827. One unidentified Manchester resident said that '"Mormon Hill' had been long designated 'as the place in which countless treasures were buried/ Joseph, the elder, had 'spaded' up many a foot of the hill side to find them, and Joseph Jr., had on more than one occasion accompanied him." In 1880, Frederick G. Mather said, "Returning to the vicinity of Palmyra [from Pennsylvania], Smith and his followers began to dig for the plates on the eastern side of the hill." Mather connected this digging with events of 22 September 1827, but five years later Lorenzo Saunders corrected Mather's dating. 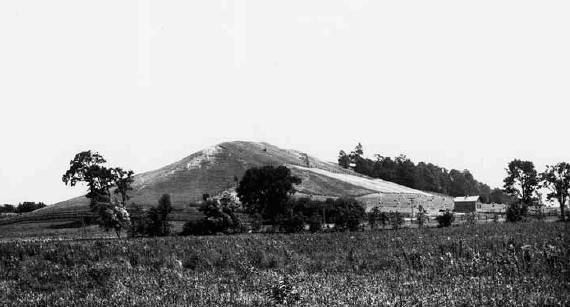 Saunders, who visited the hill within days after Smith removed the plates, said he found no disturbance of the earth except"a large hole" which had been dug by the "money diggers" about "a year or two before." In August 1831, James Gordon Bennett noted that on"Golden Bible Hill. . . there is a hole 30 or forty feet into the side—6 feet diameter." The existence of this hole on the northeast side of the hill in 1867 was verified by Pomeroy Tucker, who said that the excavation was"yet partially visible," and by Edward Stevenson, who reported seeing the hole in 1871. Early residents of Palmyra/Manchester mistook this northeastern excavation for the location of the plates' repository, which Oliver Cowdery later said was "on the west side of the hill, not far from the top down it side." Whatever the nature of Joseph Smith's involvement with money diggers on the hill, both the location and timing of the digging suggest at least an indirect connection with Smith. However, Martin Harris's statement that Smith did not separate from the money diggers until after he obtained the plates indicates a more direct involvement. Moreover, the suggestion that Smith's fellow money diggers had previously dug on the hill explains why they later believed that they had a right to the plates and tried to take them from Smith. According to Joseph Knight, at least one of Smith's treasure-seeking friends, Samuel F. Lawrence, who was also a seer, "had Bin to the hill and knew about the things in the hill and he was trying to obtain them." Willard Chase also said Lawrence had been to the hill with Smith in 1825 and had seen the plates in his stone, but that Smith later said that he had taken Lawrence to the wrong location. After their marriage on 18 January 1827 at Bainbridge, Joseph and Emma Smith went to Manchester where they resided in the Smith home until their removal to Harmony, Pennsylvania, in December. During this stay in Manchester, Joseph Smith engaged in treasure-seeking activities before obtaining the plates in September. Both Martin Harris and Lorenzo Saunders state that Smith led a treasure-digging company up to the time he received the gold plates; Harris specifically claimed that Josiah Stowell was visiting the Smiths in Manchester "digging for money" when Joseph took the plates from the hill. Joseph Capron, who lived south of the Smiths on Manchester Lot 1, reported that Joseph Jr. using a stone in his hat had located "a chest of gold watches . . . north west of my house," and that in 1827 a company of money diggers, led by Samuel F. Lawrence, attempted to unearth the treasure. Capron's farm was situated on the most southern portion of Manchester Lot 1, and the dig possibly occurred on the west side of Stafford Road. The places where they [Smith and Harris] dug for the plates, in Manchester, are to be seen. Mormonism Unvailed, Eber D. Howe, 273. Editor Comment: If Joseph did indeed dig for treasure on Hill Cumorah years before he removed the gold plates, this creates some conflict with the story of Joseph being instructed by the angel Moroni to unearth the gold plates from the stone box. This shows that Joseph was actually digging for treasure on Hill Cumorah 'a year or two before' he removed the plates and perhaps right up until the time Joseph says he removed the plates from the hill on September 22, 1827. Why would Joseph have been digging for treasure on Hill Cumorah (or anywhere for that matter) after he was told by the angel that "he must have no other object in view in getting the plates but to glorify God, and must not be influenced by any other motive than that of building his kingdom; otherwise he could not get them"? Joseph reportedly met with the Angel Moroni on the very spot where the stone box was buried every September 22 from 1823 through 1827. Having been to the exact spot five times in over four years, Joseph would know precisely where the plates were buried, so why would he dig in other places on the same hill to find hidden treasures when he was forbidden to take the one treasure he was informed about? This would have been in between the time Joseph first conversed with the angel and when he removed the plates from the hill, hardly an activity Moroni would have approved. Today there is no tangible evidence for the Book of Mormon plates, the urim & thummim or the breast plate that Joseph Smith said he found in a stone box on Hill Cumorah. They were reportedly returned to the angel Moroni or to a secret cave hidden inside of Hill Cumorah. But what of the stone box that contained these sacred items? Nothing was ever reported by Joseph that anything happened to the original stone box, so why is there no evidence that it existed? However, there's no reliable account that anyone (other than Joseph Smith) actually saw the stone box that held the gold plates and other Nephite relics. The two accounts of witnesses who claimed to have seen the stones at the bottom of the hill, merely presumed them to have come from Moroni's stone box, are suspect. The first account published in 1893 doesn't even name the person who reportedly told Edward Stevenson that he found some flat stones at the bottom of the hill which he "assumed" came from the stone box. This retelling of a story from an unknown "old man" is dubious at best. The second story, reported in the Chicago Times in 1875, claims that David Whitmer saw the casket three times. This is suspect for a couple of reasons 1) There are no substantiating accounts that David saw the casket once, let alone three times as stated. 2) The "seer-stone" referred to was the stone found on Mason Chase's property that Joseph used to translate the Book of Mormon with but it was not the "spectacle version" of the Urim & Thummim that came in the stone box. If the reporter confused these details, he may have also confused other details. The "casket" (stone box) apparently held up to the harsh elements for 1,400 years after Moroni made it in the 5th century so why all of a sudden would the box get washed down the hill? How would this even happen? The box was large enough to hold a breastplate, the gold plates and the urim & thummim, and, according to Cowdery's account, there were "cement pillars" elevating the gold plates above the breastplate. A modest estimate would put the interior dimensions of the stone box around 20" wide x 30" long by 16" high. Increase the size for the thickness of the stones comprising the box and the cement binding it all together. Maybe the size of it is what prompted the term "casket." Joseph's himself said that the capstone was of "considerable size" requiring him to use a lever to move the stone. Even the LDS illustration of this event at the top of this page shows a top stone that must have weighed 100 lbs or more. The box was buried underground (according to Cowdery, it was actually built underground) except for the top capstone. One would assume the entire box would have been relatively heavy. How would this box first work itself out of the ground and then somehow find itself at the bottom of the hill? A heavy stone box, square in shape, is not simply going to be washed down a hill like pebbles. Simply put, if the stone box survived 1,400 years in the ground then it would still have been there decades after Joseph removed the contents. Where did it go? No hole was ever found from the box. The time he claimed to have taken the plates from the hill was on the 22 day of September, in 1827, and I went on the next Sunday following with five or six other ones and we hunted the side hill by course [i.e. "in a search pattern"] and could not find no place where the ground had been broke. There was a large hole where the money diggers had dug a year or two before, but no fresh dirt. There never was such a hole; there never was any plates taken out of that hill nor any other hill in country, was in Wayne county. It is all a lie. These accounts from Lorenzo Saunders seem more reliable as we have an exact date and he also claims to have gone there with several people, including one named as Robinson. Lorenzo and his crew should have been able to find a freshly dug hole if the stone box had been removed. If it had not been removed, then the stone box would have been found either that day, some time in the future or would still be there now. Of course with all the people who have looked on the hill since then, it is inconceivable that it would still be there today. The physical evidence for the existence of the Book of Mormon that could be used to prove it to have been a real, tangible item are no longer extant, including the stone box it was supposedly stored in. One theory is that not only the gold plates were taken by Moroni, but the stone box as well. However, some physical evidence (facsimiles and papyri) from another book Joseph Smith claimed to translate the Book of Abraham, are still on this earth. If fragments from these sacred ancient writings were not taken back into heaven, then why would anyone think that a stone box would have been removed from the earth when they are not as important or provide nearly the physical confirmation of the Church's historical claims than the Book of Abraham facsimiles and papyri? The confirmed existence of the stone box would at least provide a little more substance to Joseph's claims, although still not enough to prove them. There was never any statement by Joseph that the stone box (and the hole that it was in) was removed by the angel, so evidence of it should have remained and would have been discovered, but it never was, which makes it likely that the stone box never existed, which in turn leads one to believe the gold plates never existed. "More on Treasure Seeking." Dialogue: A Journal of Mormon Thought 28 (Winter 1995): viii-x.